Whether or not you have experienced an extended power outage, it is important to have an emergency plan in place. Power loss can be sudden, unexpected and caused by a variety of reasons. Weather is one of the most common causes of extended power outages. In the Northeast, we may experience storms, hurricanes, nor’easters and other events that can lead to extensive damage to power lines, power stations and your home. Installing an emergency electrical generator is one of the best ways to ensure the safety, security and peace of mind of your family and property when the power goes out. Everyone should have a plan for what to do when disaster strikes. If you live in a place that has potentially dangerous weather, this means you should have supplies in place and a general plan of action “just in case”. One of the most commonly neglected pieces of an emergency plan, however, is what to do when faced with an extended power outage. Do you know what you will do if your power is out for a few hours? What if it goes out for a few days? An electric generator will help keep your most important appliances running whenever your electrical utility fails. This includes refrigerators, medical equipment, select lights and other essentials. Choosing the right generator is perhaps one of the most intimidating steps to putting your power plan in place. There are many factors to consider, such as size, fuel source and technology. To make this easier, start by talking to the electrician who will be installing the generator into your home. They can help you choose the generator that is the perfect size for your property. Make sure to let them know of any special equipment, such as medical devices, that will need to remain powered. This way, they can ensure that your generator can provide enough power for the duration of an outage. Once you have chosen a generator, a qualified electrician must then install it. In most cases, this is a fairly simple process. Your new generator is placed on a slab outside your home, and in many cases connected to your existing natural gas or LPG lines. Some generators also run on gasoline. You should choose the fuel source that makes the most sense for you, depending on what is available in your area. Generators that connect to your gas utility can provide the most consistent power, because you do not need to fill them manually. After it has been connected to a fuel source, your generator will interface directly with your home electrical system to help provide nearly seamless power during an outage. In the past, running a backup generator was a very manual process. You had to fill the fuel tank manually, crank the engine and connect your devices into it. As technology has advanced, many of these steps have been removed. The average emergency generator now operates on near autopilot. When you have your generator installed, your electrician will use a special transfer panel to connect your generator to your existing electrical system. This panel is not only used to connect your generator directly into your existing electrical system, but also to detect an outage as soon as it occurs. It will then start your generator, giving you an almost seamless flow of power into your home. When power from your utility company returns, your electric generator will shut off automatically, avoiding excess fuel usage. 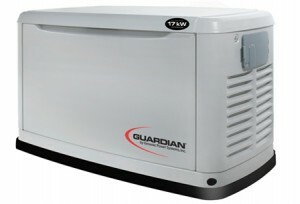 Installing a backup generator can greatly increase your peace of mind both before and during a power outage. During an outage, this source of emergency power will improve your comfort and safety throughout a storm or other emergency situation. Furthermore, a generator can help to preserve food, provide heat in the winter and keep you cool in the summer. Don’t leave your family in the dark the next time your power goes out. Add a backup generator to your home and know that electricity is one less thing that you have to worry about. Have you created an emergency power outage plan?